The Manawatu Stewart Centre, whose rehabilitation clients attended Michelle Edmondson's art programme, was presented third place in the Passion Art Creative Communities Organisation Award in Palmerston North in November 2015 for including this art programme in its schedule. Michelle Edmondson ran art classes for two hours a week from 2012 to 2015. Under the umbrella of the Artistic Solutions Trust, she received funding of $9000 to run the classes from the Creative Communities Scheme, administered by the Manawatu District Council. 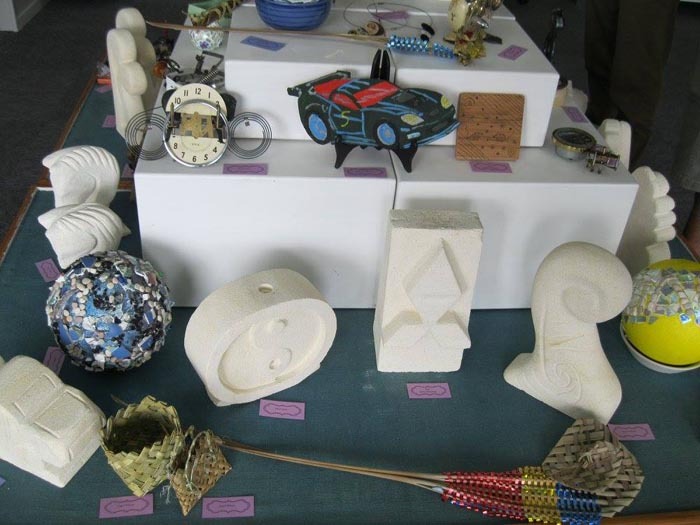 The art classes, called Creative Pathways, included mosaics, printing, collage, jewellery, steampunk, quilt-making, felt-making and oamaru-stone carving. The Manawatu Stewart Centre supports people with head injury and stroke. Also attending Michelle’s classes were clients of neurological societies, including people with Parkinson’s and multiple sclerosis. The Manawatu District Council suggested Michelle start running two courses of six to eight weeks. She did two lots of nine weeks with a group of people with Alzheimer’s Disease. “It was amazing. We had a great time,” she said. 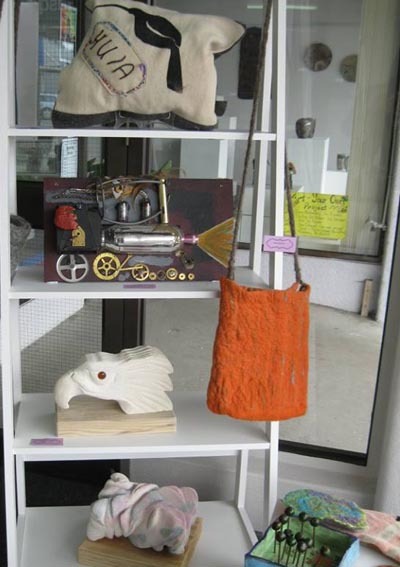 Michelle always held the weekly classes at the Feilding Art Centre so there were always exhibitions on display that inspired the group and gave them something to talk about. The tutors would come in with a set programme and they'd “read” the group to see how that was working, Michelle says. Then they'd “wing it” and go in another direction if they felt there was a more effective way of working with the group. Janet Webb, Service Manager of the Manawatu Stewart Centre, says the course Michelle ran had enormous benefits, providing social interaction and a safe space. 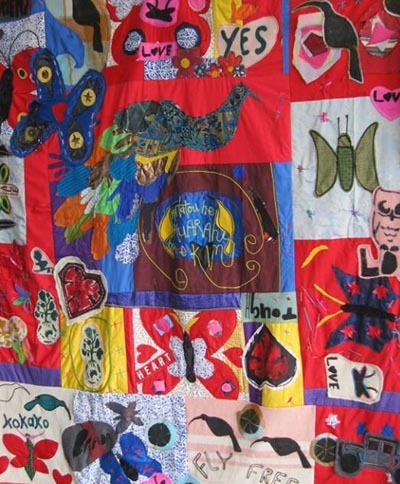 One such project was a communal quilt with a peacock at the centre. “The feathers of the tail were everybody's hand-print that had been cut out and stitched on, “Janet says. “Many of the participants affected by stroke have got physical disabilities and challenges. So, for example, they had to work closely together to manipulate a needle and thread, and sometimes people had to hold each other's fabric. The Manawatu Stewart Centre is running the course this year. There has also been interest for the project to be run in retirement homes. For more information, contact Janet Webb (E: info@stewartcentre.org.nz T: 06 354 6728). For more information about the Creative Communities Scheme in your region, visit the Creative New Zealand website. Original generation time 1.5193 seconds. Cache Loaded in: 0.0604 seconds.